In June 1943 in Algeria, North Africa, the Free French founded the Comité Fran­çais de Libéra­tion Nationale (CFNL). 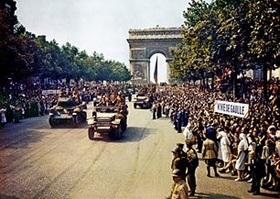 Much poli­tical maneu­vering was needed to merge the Free French, whose nu­cleus con­sisted of French­men who had escaped Ger­man cap­ture at Dun­kirk, the Channel port in North­western France (May 26 to June 4, 1940), with poli­ti­cians and armed forces from the French terri­tories freed by the Allies. Rival leaders Gen. Charles de Gaulle and Gen. Henri Giraud agreed to share the presi­dency of the CFNL. On this date, June 2, 1944, Churchill, whose rela­tion­ship with de Gaulle was only slightly warmer than FDR’s, sent two passenger air­craft and a per­sonal emis­sary to Algiers to fly de Gaulle back to Britain. Churchill played on de Gaulle’s ego by having an RAF band play the “Marseil­laise” as the general descended the plane’s steps. Churchill’s inten­tion was to hand de Gaulle a script to read over the radio on D‑Day, but the gen­eral declined because it made no men­tion of his being the legit­i­mate in­ter­im ruler of France and it in­structed French peo­ple to obey Allied mili­tary author­i­ties pending elec­tions. Rejecting the role of stooge, de Gaulle exchanged hurt­ful words with Chur­chill. Only on August 1, 1944, did the Allies permit the Free French 2nd Armored Divi­sion under Gen. Philippe Leclerc to set foot on French soil in liberated Nor­mandy. Fifteen days later the French First Army (then called French Army B) under Gen. Jean de Lattre de Tassigny parti­ci­pated in the Allied invasion of Southern France (Operation Dragoon). 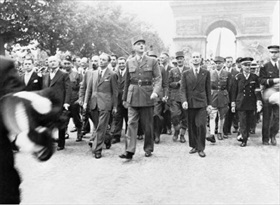 In the meantime de Gaulle made a whirl­wind visit to the city of Bayeux in Nor­mandy, pro­claiming Bayeux to be the capi­tal of Free France and leaving his aide-de-camp to head the civil admin­is­tra­tion. It was only in October, after most of France had been lib­er­ated from the German occupiers, that Chur­chill and Roose­velt recog­nized de Gaulle’s “govern­ment” as the pro­vi­sional govern­ment of France. The wily Frenchman had outsmarted les Anglo-Saxons. 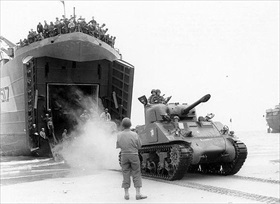 Left: Christened Ile-de-France, a French Army M4 Sherman tank lands on Utah Beach in Nor­mandy, August 2, 1944, just under two months since the ini­tial D‑Day landings. Some 14,454 per­son­nel and equip­ment from Gen. Philippe Leclerc’s 2nd Armored Divi­sion landed over the next few days. Leclerc juggled three roles: He was a sub­or­di­nate divisi­onal com­mander in an Amer­i­can army, he was the com­man­der of a sepa­rate national (French) force, and he was Gen. Charles de Gaulle’s man on the scene. 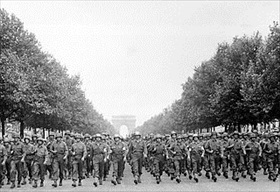 Right: A combined Franco-American military parade was hastily organized on August 29, 1944, which featured Maj. Gen. Norman D. Cota’s 28th Infantry Division marching down the Champs Élysées a little over a month after it stepped ashore on Nor­mandy’s beaches. After enjoying a respite, the division headed east to the German defensive Sieg­fried Line (West­wall), where it was the first of the Allied armies to reach German soil. Taking costly casual­ties during the ill-conceived Battle of the Huert­gen Forest (beginning mid-Septem­ber 1944) and the Battle of the Bulge (mid-Decem­ber 1944 to late Janu­ary 1945), the divi­sion memor­ably distin­guished it­self by impeding German advances in the Ardennes Forest in late December 1944, affording time for the Allies to organize the heroic defense of Bastonge in Belgium.